RDS Decorating is an independent painting and decorating contractor based in Beckenham, South London. RDS asked DigitalBulldog to design and build a new website and create a unified identity for the business. We created a new logo, based on one the client had been using for a few years. Most importantly, the new logo is fully adaptable for use not just as a company symbol but also suitable for the business cards and flyers which we also designed for RDS. Our recommendation for the site was to keep it basic. The site provides a point of contact, gallery of work, testimonials, concise text on the client’s services, and pushes social media channels. We used animated sliders for focusing attention, and we used our proprietary InfoMax™ format for longer sections of text. The construction of RDS Decorating was our last “old school” build in using basic HTML/CSS. 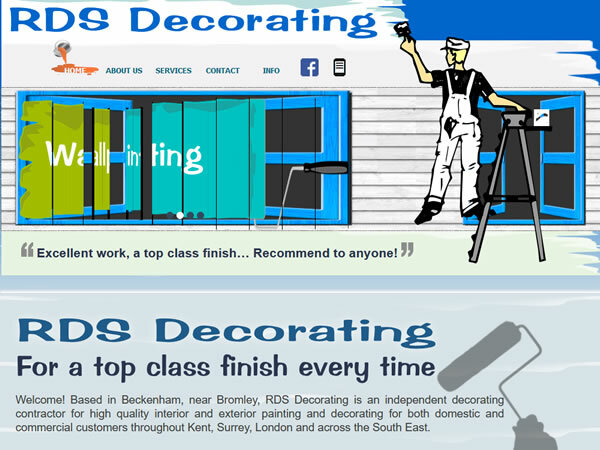 Visit RDS Decorating for the best decorating prices in South London. View other active projects in our portfolio here.